Heavenly blog! : Nr. 391: Are you truly converted? Or imagine you and others it yourself? The key to this is if you have fruits for repentance in your life, dear friend! Nr. 391: Are you truly converted? Or imagine you and others it yourself? The key to this is if you have fruits for repentance in your life, dear friend! Are you truly converted? Or imagine you and others it yourself? The key to this is if you have fruits for repentance in your life, dear friend! After hearing many who boast of their own conversion but they are not ripe that they are converted, then I have to ask about their lives measure up within its God. And this goes first with myself, but we as believers are allowed to judge our faith siblings teaches writing. 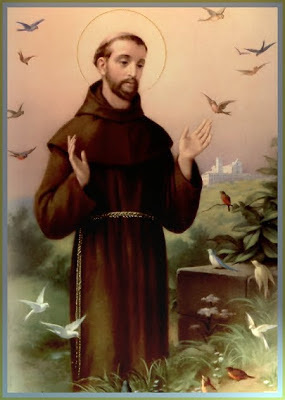 Here is a picture that Francis of Assisi was a Catholic, but had such lovely fruit in their lives as believers testify that he was converted in spite of belonging to the Catholic Church. Witness a life of repentance or that you are unrepentant? Paul says: "Not that which gives itself credentials approved, but the Lord praise." (2 Cor. 10.18) To speak harsh words about themselves, their own spiritual life and ministry, and affirm their faithfulness to Peter Samson did, shows the danger by testifying himself. There is another who will testify about us (Proverbs 27, 2 Let another praise you, and not your own mouth, a stranger, and not your own lips). Even Testimony of this kind reveals great confidence, and precisely this is many people's main concern, - faith in themselves. Such confidence is often the biggest obstacle to the Lord can use a man in his service in the right way! Especially those who have been in the "world" before they become believers really need to brag! Especially those who have been in the "world" before they become believers really need to brag about themselves, but also those who have been faithful all her life takes after. But is it biblical? Yes and no Apostle Paul "boasted" of his revelations, but then he had to get up in the sky and were taught by Jesus himself. But var14 years later it happened that he said this. It has to do with humility. Samson won glorious victory, but he did not reveal the secret! The book of Judges 14 5 Then went Samson and his father and mother, to Timnath, and came to the vineyards of Timnath: and, behold, a young lion roared against him. 6 Then the Lord came upon him, and he tore it to pieces as it was to be a kid, even though you had nothing in his hand: but he told not his father or his mother what he had done. 7 Then he went down and talked with the woman, and Samson well her. 8 A few times after he went down again to marry her, and then he took off the road and tried to look for the lion's carcass, when there was a swarm of bees in the carcase of the lion, and honey. 9 He took the honey out and held it in his hands and ate as he went, and when he came to his father and mother, he gave them to him, and they did eat: but he told not them that it was the lion's body he had taken the honey. I like Samson, not least when he is in the Spirit. He's so perfect, both bold and humble. He had won a glorious victory and turned a lion to death, and based on this lion body, he was blessed. He found honey in there and gave the honey to his Father and Mother, without saying in that it was his overwhelming victory that was the cause. We all have something to learn! Where are the fruits of your life, Jesus will ask about that day we shall stand within its him! It does not help to have large reports or large churches behind. No one has a larger congregation behind them than the Pope, but he is a believer? I've been to the Vatican and set, for me it is a place that is so far from true Christian faith is almost possible to get. It is dead popes over the place in the Vatican and feel an eerie, go there, if Rome is a great and beautiful city or they do not represent the Pope and the Catholic church gospel we read about it in the Bible. How is it achieved with the Free Church? Unfortunately, it is also lacking in the fruit and love. The condition is so bad that than have entered the Laodicean church age in the Western world at large and all. Is afraid that Jesus would have said that depart from me, ye that do iniquity among the majority of the Free Church movement in the Western world if it is not a true repentance before he comes back, he says here in Matthew. Unfortunately so totally mistranslated in the Norwegian Bible that I will render it correctly translated from Arne Jordly his translation is correct, Hallelujah! Matt. 7. 21 "Not everyone who says 'Lord, Lord' will enter the kingdom of heaven, but those who do my Father's will. 22 Many will say to Me in that day, 'Lord, Lord, have we not prophesied in Your name, and we have not driven out demons in Your name, and done many wonderful works?' 23 And then I will declare to them, 'You have never known me. Depart from me, you who are doing lawlessness. " Note the wording: "Driver of lawlessness." Here there is an active word. Or a verb. One is not converted, but "serve" God. I have eg. warned against Pastor Jan Hanvold which unfortunately so many pops up on his channel. But Hanvold living in blatant sin and doing strange teachings, yet he becomes more and more accepted among any believers in Norway. Even Bjarne Steel Power which I have set very high as preacher and man pops up there on that channel. I ask myself how far we have come in the apostasy?! We arrived late at night and Jesus can come again soon, one of the character of this are self-confident Christians who do not see their own apostasy! We read about the church in Laodicea missing eye ointment. From my commentaries Revelation 3 15 I know your works: you are neither cold nor hot. I wish you were cold or hot! Laodicea had a big problem with the water supply. The local sources were contaminated, and when they tried to bring water through aqueduct to the city, the water was lukewarm and not very appealing. This meant that the city has lost its wealth and was abandoned. Neighboring cities however had it better. Hierapolis had hot springs, which were healing and Colosse the pure cold springs. This should describe the condition of the church in Laodicea. This image uses the Lord Jesus in order for them to understand and be aware of their spiritual condition. 16 But thou art lukewarm, not cold and not hot. I will spit you out of my mouth. Jesus goes so drastic action as in Matthew 23 When he rebukes the Pharisees and the scribes. Now Jesus uses the same powerful verbal attack against his own church, or they are no longer his church? They live in a spiritual self-deception that Jesus opposes the strongest. Because you are lukewarm, he queasiness over them! Matt. 7. 21 Not every one that saith unto me, Lord, Lord! shall enter the kingdom of heaven, but he who does the will of my heavenly Father. 22 Many will say to Me in that day, Lord, Lord! Did we not prophesy in your name, and cast out demons in Your name, and done many mighty works in your name? 23 And then will I declare to them, 'I never knew you. Away from me, you evildoers! 17 "I am rich," you say, "I have abundance and lack nothing." But you do not know that you are wretched, pitiful, blind, poor and naked. This ambivalence which basically is hypocrisy Jesus warns against the strongest. Here, the church itself to be rich, successful and everything is in the most beautiful and best order. But it is exactly the opposite. Lousy can stand for the care of those who fall without a past is gone, a grower only friendships with their own friends. Pitiful can stand to lack spiritual backbone. Blind is no longer tell the difference between something in the spiritual world. The poor are losing the gifts and fruit of the Spirit. Naked is losing salvation garment. Here the church was in the deepest and utmost spiritual poverty and need. 18 Therefore I counsel you to buy from me gold refined in the fire, that you may become rich, and white garments that you can dress up with and hide your naked shame, and salve to put on your eyes, so you can see. But the offer of restoration and to come back to him standing at approximately even in this church. But then they had to catch a tried and persevering faith. White clothing is not to be defiled by sin and the filth of the world. Furthermore, the offer and demand of the heart opplatte eyes. It's really where we all have to come back to! Efes. 1. 17 I pray that our Lord Jesus Christ, the glorious Father, let you the Spirit of wisdom and revelation, so that you learn to know God. 18 May he eyes of your heart light, that you may know the hope to which he has called you, the riches of his glorious inheritance in the saints, 19 and where his power is really with us who believe. With this great power and strength 20 he traveled up Christ from the dead and set him at his right hand in heaven, 21 over all principalities, above all might and dominion, and every name that is named, not only in this world, but also in the future. 22 All he laid under his feet, giving him the head over all things, he has given to the church, 23 which is his body, the fullness of him who fills all in all. To pray this prayer every day will have a decisive impact on every life. 19 All that I hold dear, rebuke and chasten me. So be earnest and repent! Is this done in love? How is the love we read in 1 Cor. 13? v. 6 does not rejoice in iniquity, but his joy in the truth. There may be serious and need to take it to heart that the message concerned them. 20 Behold, I stand at the door and knock. If anyone hears my voice and opens the door, I will come in to him and eat, I'm with him and he with me. The whole congregation was very difficult to accept the message because they wanted it that scratched them in the ear. But it was, if possible, some acknowledge that the church would take it to heart? They would experience the close fellowship and communion with Jesus again. The church in Norway, especially the dissenting part is similar to the Laodicean church that one can call the Norwegian Free Church part of Christianity of Laodicea Christians. So it's been like, tragic but true! Final comment: I encourage you to read our blog and on our website to put it into this. What we produce here is on the net as a counterweight against all this, and we need your help, support and prayers more than ever. Here is our account number: 05350605845 Post's!